Find your rashi and nakshatra by birth in Tamil, along with tamil rasi and natchathiram palangal, free, online. Rasi, nakshatra and lagnam are Tamil astrology signs that corresponds to star sign, zodiac sign and ascendant. Rasi nakshatra are used for predicting the general character of an individual, also used during sankalpam, religious, traditional and special ceremonies like wedding, graha pravesam, etc. 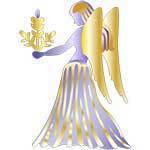 Apart from astrological predictions, astrology signs are also used for spiritual and traditional events. During religious ceremonies, every individual is identified by name, nakshatram and rasi. Rashi and nakshatra by birth time, date and place is found from the information given in the panchangam for your birth place. Tamilsonline generates your local panchangam instantly and find your rasi natchathiram in tamil, online. Tamil astrology signs are divided into three categories, known as nakshatra (birth star), rasi (zodiac sign), and lagna (ascendant sign). 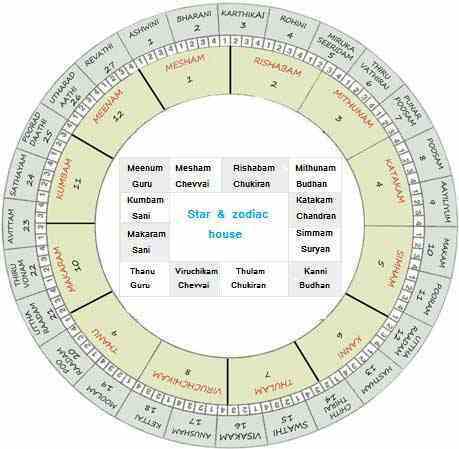 Rasi natchathiram circular chart on the right column shows how each natchathiram and its patham is divided, and the rasi or zodiac house they occupy in our solar system. Rasi and nakshatra list or table are based on Tamil astrology system, known as sidereal zodiac system. In Tamil astrology, birth star table consists of twenty seven nakshatras or star signs. List of nakshatra are as follows; ashwini, parani, kaarthikai, rohini, mirukaseeridam, thiruvaathirai, punarpoosam, poosam, aayiliyam, makam, pooram, uththiram, hastham, chiththirai, swaathi, visakam, anusham, kettai, moolam, pooraadam, uththiraadam, thiruvonam, avittam, chathayam, pooraddathi, uththiraddathi and revathi. Table of twelve rasis or zodiac signs in Tamil are mesham (aries), rishabam (taurus), mithunam (gemini), kadakam (cancer), simham (leo), kanni (virgo), thulam (libra), viruchikam (scorpio), thanu (sagittarius), makaram (capricorn), kumbam (aquarius) and meenam (pisces). Rasi nakshatra calculator based on Tamil astrology instantly finds your Tamil astrology signs such as nakshatra, rasi and lagnam; and also provides rasi palan and Tamil natchathiram palangal, free, online. With our online nakshatram, rasi and lagnam calculator, find out your rashi and nakshatra by birth in tamil, online.